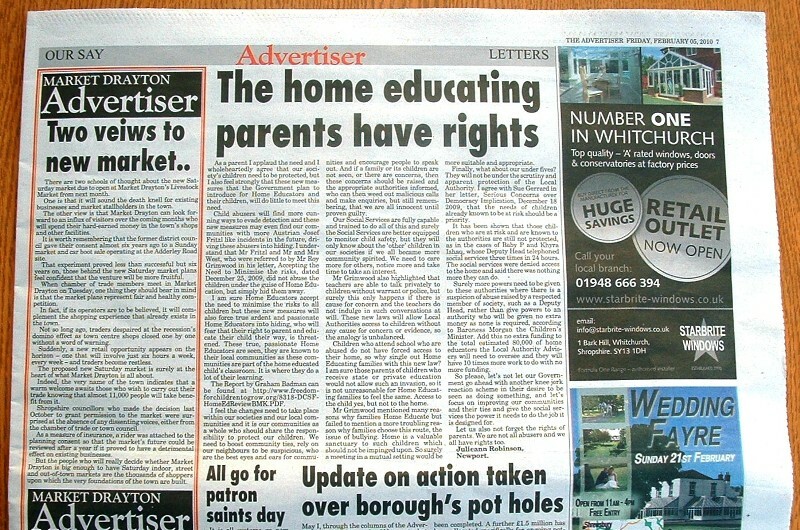 I thought it had gone all quiet on the local press front – no reason to send out a press release recently – but then the letter below jumped out and hit from the Market Drayton Advertiser. Turned out that we had missed a critical letter published over the Christmas holidays, but thankfully another home educator spotted it. Julieann Robinson’s letter is below, but if you are wondering about the gap since Mr. Grimwood ‘s letter and Julieann’s reply, it was so long that even she thought they had lost it! As a parent I applaud the need and I wholeheartedly agree that our society’s children need to be protected, but I also feel strongly that these new measures that the Government plan to introduce for Home Educators and their children, will do little to meet this need. Child abusers will find more cunning ways to evade detection and these new measures may even find our communities with more Austrian Josef Fritzl like incidents in the future, driving these abusers into hiding. I understand that Mr Fritzl and Mr and Mrs West, who were referred to by Mr Roy Grimwood in his letter, Accepting the Need to Minimise the risks, dated December 25, 2009, did not abuse the children under the guise of Home Education, but simply hid them-away. I am sure Home Educators accept the need to minimise the -risks to all children but these new measures will also force true ardent and passionate Home Educators into hiding, who will fear that their right to parent and educate their child their way, is threatened. These true, passionate Home Educators are seen, they are known to their local communities as these communities are part of the home educated child’s classroom. It is where they do a lot of their learning. The Report by Graham Badman can be found at http://www.freedomforchildrentogrow.org/8318-DCSFHomeEdReviewBMK.PDF. I feel the changes need to take place within our societies and our local communities and it is our communities as a whole who should share the responsibility to protect our children. We need to boost community ties, rely on our neighbours to be suspicious, who are the best eyes and ears for communities and encourage people to speak out. And if a family or its children are not seen, or there are concerns, then these concerns should be raised and the appropriate authorities informed, who can then weed out malicious calls and make enquiries, but still remembering, that we are all innocent until proven guilty. Our Social Services are fully capable and trained to do all of this and surely the Social Services are better equipped to monitor child safety, but they will only know about the ‘other’ children in our societies if we all became more community spirited. We need to care more for others, notice more and take time to take an interest. Mr Grimwood also highlighted that teachers are able to talk privately to children without warrant or police, but surely this only happens if there is cause for concern and the teachers do not indulge in such conversations at will. These new laws will allow Local Authorities access to children without any cause for concern or evidence, so the analogy is unbalanced. Children who attend school who are abused do not have forced access to their home, so why single out Home Educating families with this new law? I am sure those parents of children who receive state or private education would not allow such an invasion, so it is not unreasonable for Home Educating families to feel the same. Access to the child yes, but not to the home. Mr Grimwood mentioned many reasons why families Home Educate but failed to mention a more troubling reason why families choose this route, the issue of bullying. Home is a valuable sanctuary – to such children which should not be impinged upon. So surely a meeting in a mutual setting would be more suitable and appropriate. Finally, what about our under fives? They will not be under the scrutiny and apparent protection of the Local Authority. 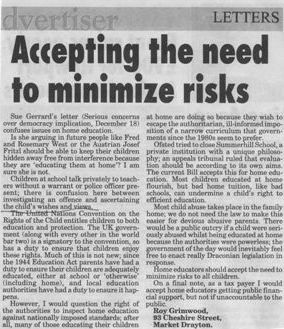 I agree with Sue Gerrard in her letter, Serious Concerns over Democracy Implication, December 18 2009, that the needs of children already known to be at risk should be a priority. It has been shown that those children who are at risk and are known to the authorities are still not protected, as in the cases of Baby P and Khyra Ishaq, whose Deputy Head telephoned social services three times in 24 hours. The social services were denied access to the home and said there was nothing more they can do. Surely more powers need to be given to these authorities where there is a suspicion of abuse raised by a respected member of society, such as a Deputy Head, rather than give powers to an authority who will be given no extra money as none is required, according to Baroness Morgan the Children’s Minister. Add this no extra funding to the total estimated 80,000 of home educators the Local Authority Advisers will need to oversee and they will have 10 times more work to do with no more funding. So please, let’s not let our Government go ahead with another knee jerk reaction scheme in their desire to be seen as doing something, and let’s focus on improving our communities and their ties and give the social services the power it needs to do the job it is designed for. Let us also not forget the rights of parents. We are not all abusers and we all have rights too. Mr Grimwood also highlighted that teachers are able to talk privately to children without warrant or police, but surely this only happens if there is cause for concern and the teachers -do riot. indulge in such conversations at will. These new laws will allow Local Authorities access to children without any cause for concern or evidence, so the analogy is unbalanced. Mr Grimwood mentioned many reasons why families Home Educate but failed to mention a more troubling reason why families choose this route, the issue of bullying. Home is a valuable sanctuary – to such children which. should not be impinged upon. So surely a meeting in a mutual setting would be more suitable and appropriate. So please, let’s not let our Government go ahead with another knee jerk reaction scheme in their desire to be seen as doing something, and let’s focus on improving our communities and. their ties and give the social services the power it needs to do the job it is designed for. Julieann has provided me with a scan of Mr Grimwood’s letter and the text is below. 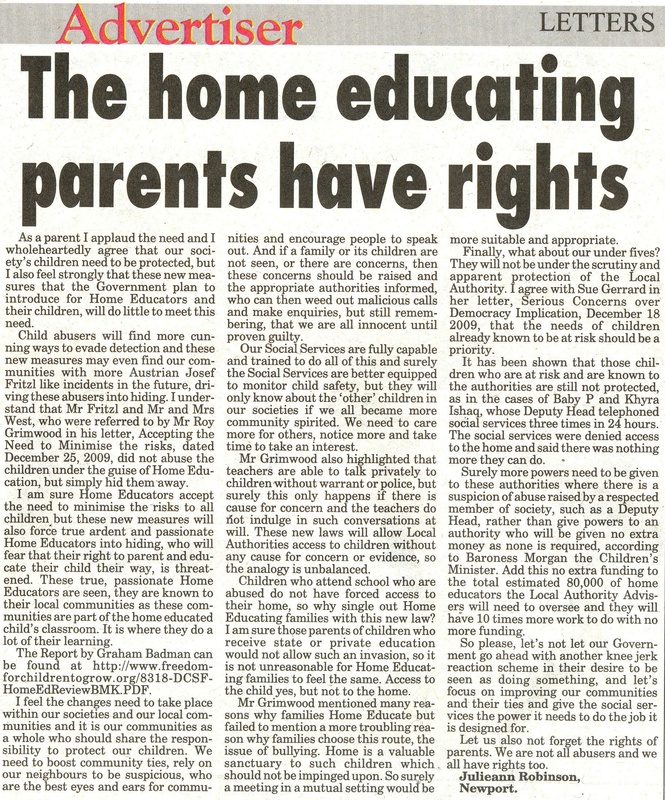 Sue Gerrard’s letter (Serious concerns over democracy implication, December 18th) confuses issues on home education. Is she arguing in future people like Fred and Rosemary West or the Austrian Josef Fritzl should be able to keep their children hidden away free from interference because they are “educating them at home”? I am sure she is not. Children at school talk privately to teachers without a warrant or police officer present; there is confusion here between investigating an offence and ascertaining the child’s wishes and views. The United Nations Convention on the Rights of the Child entitles children to both education and protection. The UK government (along with every other in the world bar two) is a signatory to the convention, so has a duty to ensure that children enjoy these rights. Much of this is not new; since the 1944 Education Act parents have had a duty to ensure their children are adequately educated, either at school or “otherwise” (including home), and local education authorities have had a duty to ensure it happens. However, I would question the right of the authorities to inspect home education against nationally imposed standards, after all, many of those educating their children at home are doing so because they wish to escape the authoritarian, ill-informed imposition of a narrow curriculum that governments since the 1960’s seem to prefer. Ofsted tried to close Summerhill School, a private institution with a unique philosophy; an appeals tribunal ruled that evaluation should be according to its own aims. The current Bill accepts this for home education. Most children educated at home flourish, but bad home tuition, like bad schools, can undermine a child’s right to efficient education. Most child abuse takes place in the family home; we do not need the law to make this easier for devious abusive parents. There would be a public outcry if a child were seriously abused whilst being educated at home because the authorities were powerless; the government of the day would inevitably feel free to enact really Draconian legislation in response. Home educators should accept the need to minimize risks to all children. On a final note, as a tax payer I would accept home educators getting public financial support, but not if unaccountable to the public.